This week’s fossil is not technically impressive: it is a rather modestly preserved conulariid from the Waynesville Formation of southern Indiana (location C/W-111). 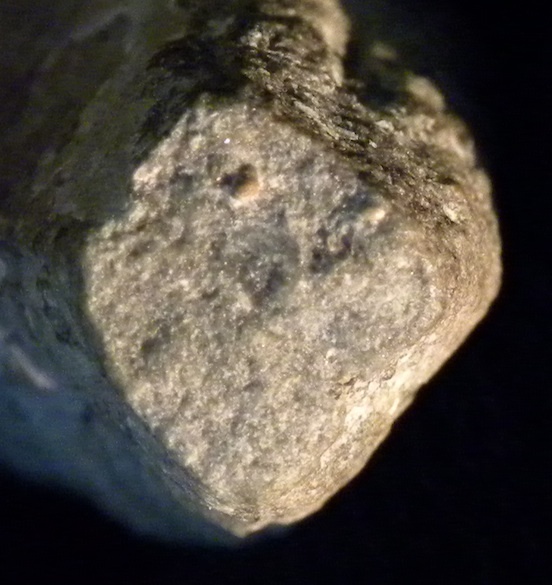 It is notable because it is one of the very few conulariids I’ve found in the Ordovician, and it gives me a chance to write about a fascinating talk three of my friends presented last month at the annual meeting of the Palaeontological Association in Dublin. The above image is a side view of the specimen. Its identity as a conulariid is indicated by the four flat sides with gently curved ridges and the distinctive grooved corner between the two visible sides. With only this part of the conulariid visible, we can at least tentatively identify the specimen as Conularia formosa Miller & Dyer, 1878. Conulariids are most likely the polyp stages of scyphozoans (typical “jellyfish”). Here is a closer view of one of the sides. You can just make out a midline running parallel to the axis of the fossil slightly offsetting the ridges. This brings us to the presentation last month at the Palaeontological Association meeting titled: “Asymmetry in conulariid cnidarians and some other invertebrates”. It was given by Consuelo Sendino from the Natural History Museum in London, with co-authors Paul Taylor (also NHM London) and Kamil Zágoršek (Národní muzeum, Prague). 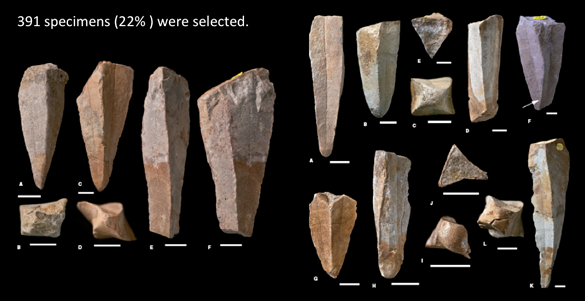 The specimens below are part of a set of conulariids they studied from the Upper Ordovician (Sandbian) of the Czech Republic. This is Metaconularia anomala (Barrande, 1867). Note that it has a very different symmetry from the typical conulariid: it is four-sided at the base and three-sided at the top. Only a minority of specimens show this asymmetry, but why any do is a mystery. Here are several more Metaconularia anomala specimens with various states of symmetry. All are internal molds. 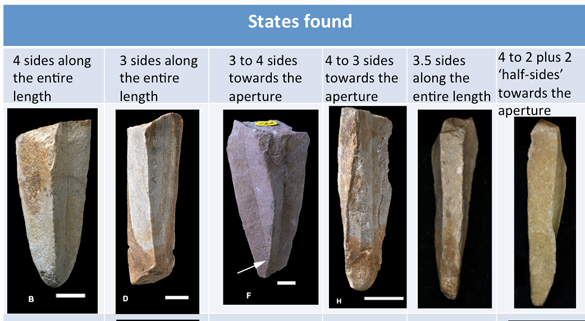 This is a summary of the symmetries present in these Ordovician conulariids. For such a simple morphology, these are surprisingly complex states. There is a pattern to this diversity: these conulariids show a kind of sinistral coiling — a directional asymmetry. There are many questions that arise from such asymmetrical fossils. Why was the original symmetry “broken” in these individuals? Did asymmetry have adaptive value? (These aberrant individuals apparently survived to a normal size, at least.) Is this asymmetry genetically controlled or produced by the environment in some way? If there is a genetic component, has it ever had evolutionary value? 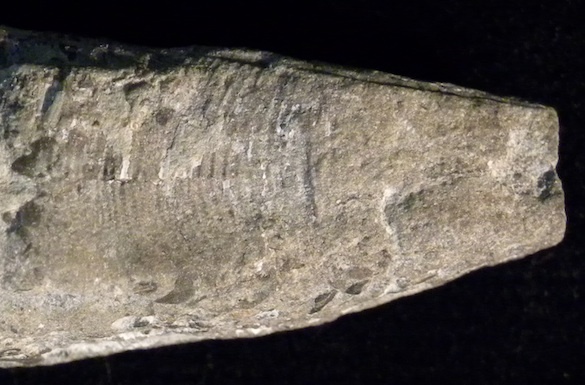 I now notice fossils that are outside normal symmetry ranges (like this Devonian brachiopod) and wonder how common and important the phenomenon is. Another paleontological wonder and mystery! Miller, S.A. and Dyer, C.B. 1878. Contributions to Palaeontology (No. 1). Journal of the Cincinnati Society of Natural History 1, no. l, p. 24-39. Sendino, C., Zágoršek, K. and Taylor, P.D. 2012. Asymmetry in an Ordovician conulariid cnidarian. Lethaia 45: 423-431. Van Iten, H. 1991. Evolutionary affinities of conulariids, p. 145-155; in Simonetta, A.M. and Conway Morris, S. (eds.). The Early Evolution of Metazoa and the Significance of Problematic Taxa. Cambridge University Press, Cambridge. Van Iten, H. 1992. Morphology and phylogenetic significance of the corners and midlines of the conulariid test. 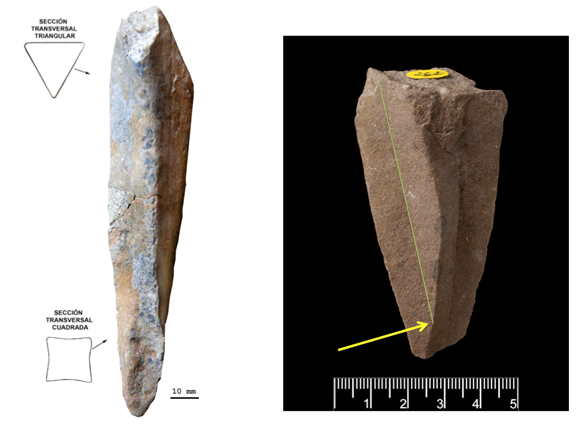 Palaeontology 35: 335-358.